Traveled Anywhere “Dangerous?” – Traveling Epic! Last week I visited Tunisia, currently on the hot list of places that would be considered dangerous. 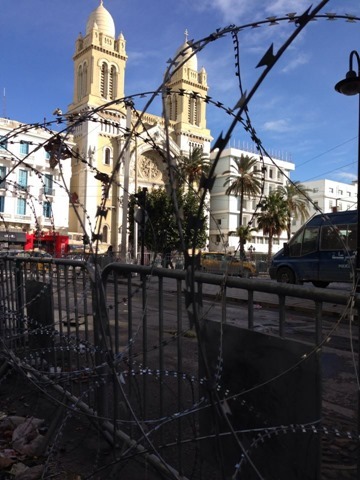 We were planning on avoiding the hot areas, but just a couple of blocks from the medina we came across a roll of razor wire that was stretched around the block in front of the French embassy. They are trying to discourage people from gathering in large numbers around the embassy. I think they saw the movie Argo. Tunis has a rap for being the first in the Arab Spring. The first to overthrow their leader and attempt to start a new government. Trying to find the right balance of religion in the government is a tough call for the Tunisians. They don’t want it too hot or too cold. Egypt is trying to figure the same thing out. They have a hard time figuring out what model to use, because there aren’t a lot of successful Islamic government models to fashion themselves after. 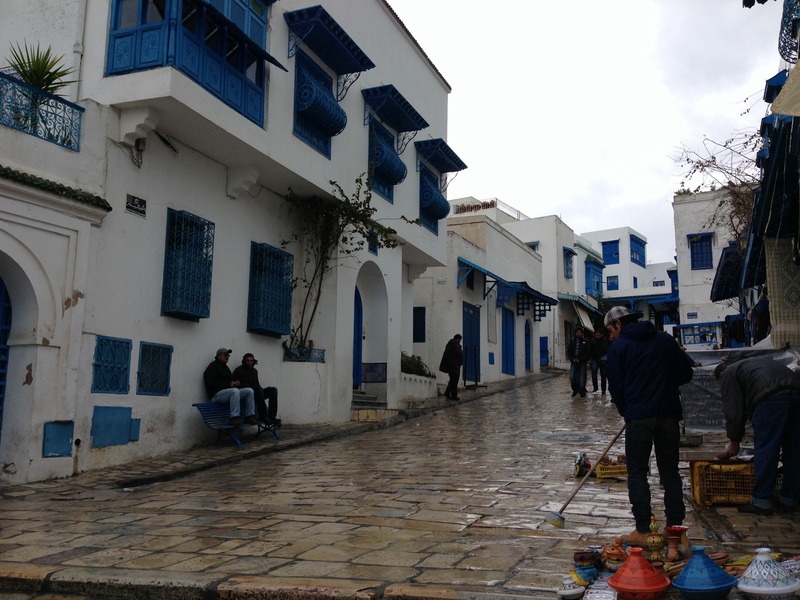 I really really enjoyed my time in Tunis, Sidi Bou Said, and Carthage. Beautiful cities, incredible people, and tons of history. In many ways I find people who have to deal with this kind of stress are either fighters or leaders. The people that Tunis has created are real movers and shakers. Tons of passion. The same could be said for some of the other amazing places around the world where conflict ultimately creating a generation that will rise above the conflict and help us all. 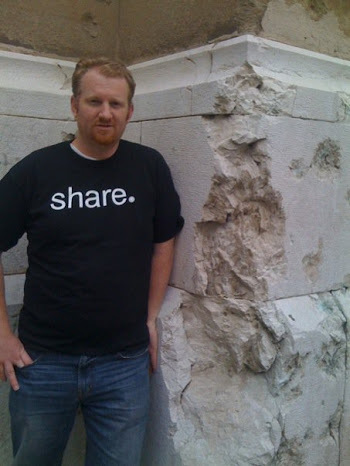 Here’s a list of my favorite places where recent conflict leaves behind a city and a people who cry to be visited. Some of the most beautiful places on the planet with darkness that is parting to light. 1. 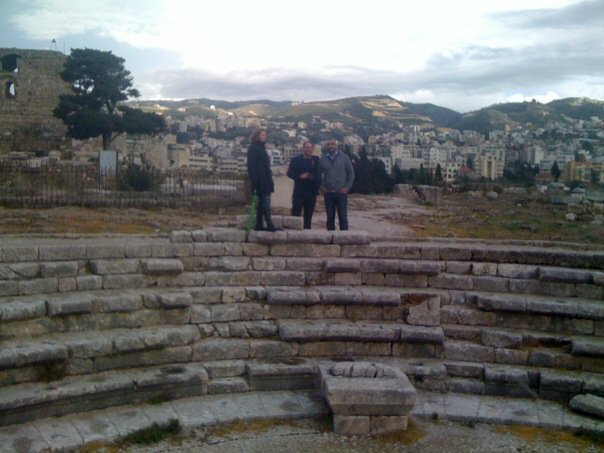 Lebanon – Beirut is one of my favorite cities in the world. It’s incredible. The food is fabulous. If you eat much Mediterranean food you will find that it’s either influenced by Lebanese or is actually Lebanese food. Lebanese… they rule in food in the middle east as well, that’s where is at it’s best. Visiting some of the old historical sites you’ll find that this area of the world has been in conflict since the time of Cain and Abel. I jest, but really since man has been sentient there have been battles for this fertile land with awesome sea access. Byblos pictured, has 10 different kingdoms that have claimed it over time and built it up. 2. Sarajevo – One of my favorite cities in Europe. Beautiful Sarajevo, Bosnia. In Bosnia you also have to visit Mostar. A tragic past, which you can research before, during or after. It really redefines the way you travel. Sarajevo is not dangerous today. The same people who fought against each other live together. They have been forced to find ways to move on. A visit to the very historical city library in Sarajevo makes this all very fresh. A walk over starimost the bridge in Most will also bring the highest of highs and lowest of lows as you see the land mines and research the tragic history of the bridge. 3. 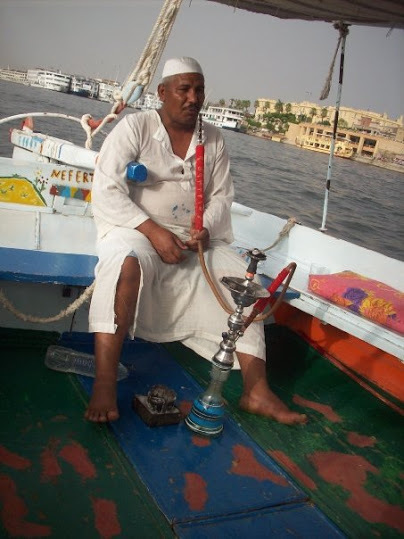 Egypt – I still consider Egypt one of the safest places on the planet. The people are so kind and caring. Yes, Cairo is a large busy dusty city, but the people really do care about their future and are having a challenging time finding the right balance for the majority and minorities in the country. Still find that Luxor is one of the places in the world where I can truly relax riding in a felucca letting the wind take me where it will. I wrote all about how I feel about visiting Egypt post revolution. I have friends who have recently visited within the past 2 weeks and they love it as well. 4. Nicaragua – This third world country has a tough rap. Due to bias from leaders in the US government this poor country has had a rough time. Definitely some of the poorest conditions in the Americas, but the beauty and simplicity is incredible. I’ve felt very safe and the amount of crime isn’t what you might perceive. Outside the capital, Managua it’s a very incredible country with much to offer the adventurer and for incredibly cheap prices. I stayed at a villa on the lake for $30 with the shores lapping right up near the doorstep. Sitting out on the balcony watching the waves… listen and you’re likely to hear monkeys just as birds, and look up to see incredible volcanoes, just beautiful. 5. Zambia & Zimbabwe – What happens when money becomes worth nothing… when 100,000,000,000,000 (100 trillion) notes are worth more as a collectible? I’ve found desperation a scary thing. I once ran into someone who said they would never go back to Africa. To me Africa is the place that keeps giving back. Every trip I go on is incredible, because it’s so raw. It’s primitive. As an anthropologist at heart, and Indiana Jones as my example, there’s no better place to explore than deep dark Africa. Believe me, there are some dangerous situations, but again even these seem safer than many of the large cities in the US where most wouldn’t think twice to visit. 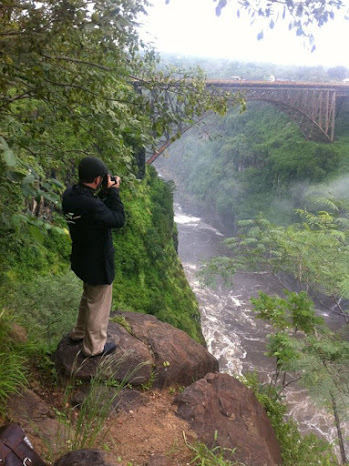 Victoria Falls is worth it. Amazing place. We ended up travelling around the whole area and really connected with locals, and it was one of my favorite trips ever. There are some people who like to visit where natures destructive force has made impact. As a child I remember going to Bountiful Utah after a flood. It was fascinating to see rivers going through people’s yards. A fascinating juxtaposition. 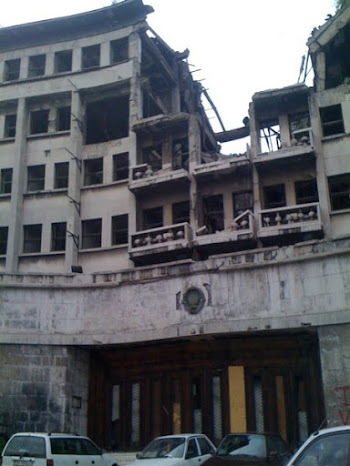 Now seeing buildings that were bombed by Clinton during the Lewinsky scandal in Belgrade, Serbia… Modern history is pretty wild. The irony here in all of this, is the *real* most dangerous places I’ve visited would not be where most Americans would think. I have felt most unsafe in Detroit, Orlando an some parts of Chicago & LA. There are a few places in Mexico that aren’t so safe, but even Mexico city has felt more safe than some of the large run areas in the US. People outside of the US, may think so too. Johannesburg does have real dangers based on desperation. Many who live there carry a second wallet. There are techniques for traveling safe and a lot has to do with keeping your wits about you. Having local contacts can really help in visiting these WILD places of the world. Travel brings perspective and erases prejudice. You say you felt the least safest in Detroit huh? Did you visit the safer areas like downtown or midtown, as you did with the international cities? Or, we’re you in the ‘hood?’ If so, that’s a double standard. It’s an example. There are safe an dangerous places in all big cities, but I’d feel safer in the roughest part of Beirut and Tunis than in the same in Detroit. My design isn’t to say that Detroit is an awful city, but the buildings did bring back memories of Beirut. There are some great areas in Detroit, no doubt.